There is this one, forgettable phase of my life when I was in college. I was heavily into learning palmistry. Armed with books by Cheiro and a magnifying glass, I would read my own palm, pretty much every day and tried to correlate my life with the length and shape of the lines on my palm. I would discuss my ‘discoveries’ with a bunch of interested and skeptical friends. It was fun and got me some attention. A steady stream of young girls and boys, mainly my juniors would come up to me asking questions about their future. I recall this one funny question a girl asked me; “Will me husband’s name begin with ‘N’”. After studying her palm I had said “Yes”. This girl almost threw me down with her hug. Just like good things, even silly things come to an end. This phase, thankfully, did not last. Science had spoken. Soon the idea of lines on the palm being able to foretell the future seemed ridiculous and I got bored. Now even though many many years have passed since that phase, I cannot help but sneak a peek at someone’s palm every once in a while to make some wild guesses by looking at some tell-tale lines. She may start her career in a foreign land. Or here is someone actively involved in some form of social work. There, I have said it. My little secret is now out on the world-wide-web. A royal blue Leheriya. Notice the irregular lines. Clearly an indication of a hand-made product. A Leheriya is a simple saree with lines that run diagonally across the body of the saree. Wow! The Leheriya saree is similar to the Bandhani, i.e. 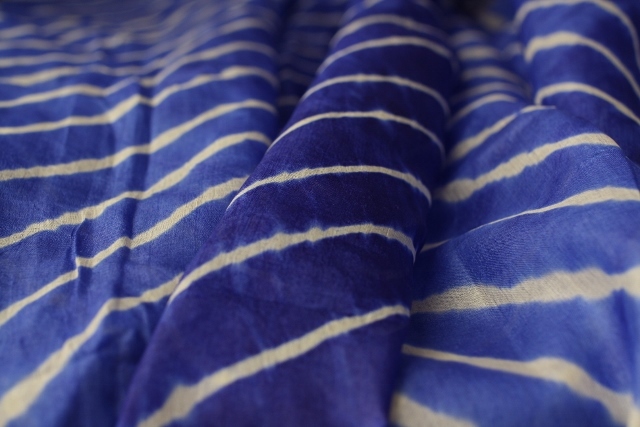 like the Bandhani, the Leheriya is also made using the tie-and-dye technique. I am not sure how the Leheriya originated as an idea. But it was most likely around when the Bandhani saree came about i.e. 7th century. 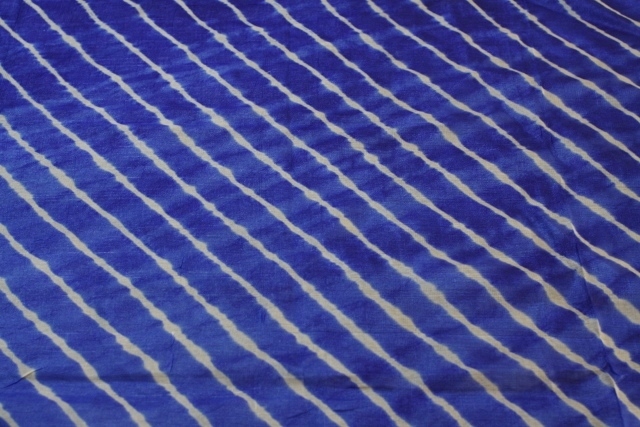 While the Bandhani saree has patterns created from a bunch of dots, the Leheriya has wave-like pattern formation made from zig-zag lines that run across the saree. Sometimes the lines run twice across each other, one set of lines originating from one end and one set originating from the opposite end. This creates a cool pattern where instead of square checks you get to see rhombus checks in the saree. 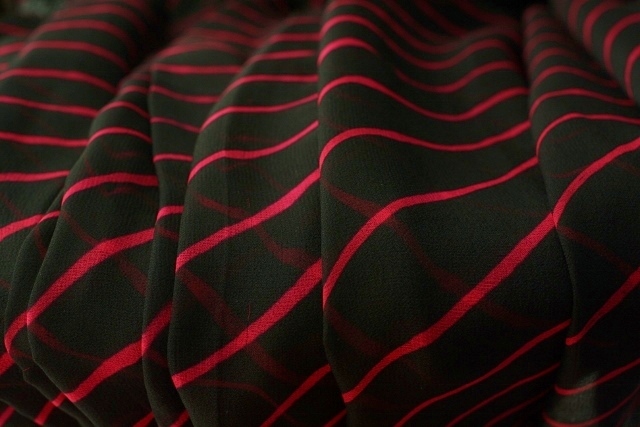 A black Georgette with fuschia lines running through. A classic Leheriya. Leheriyas owe all their characteristics to their place of origin. Bright colours, like fuschia, parrot greens, sunny yellows, bright reds, daring blacks and pure whites combined with lines of different contrasting colours are reminiscent of the joyous brightness of Rajasthan. Today, ombre shades rule the colouring styles of Leheriyas. The fabric used for creating them – thin, soft and light – suitable for harsh summers in Rajasthan. That’s why you will find most Leheriyas are Georgettes, Kota Dorias, Chiffons, Muls and Silks. If you examine a Leheriya closely you may notice a certain irregularity or a sort of an imperfection in the continuity of the lines that run across the saree. This very imperfection, which occurs every once in a while can be the proof of the saree being an authentic hand-made tie-and-dye. Although I own a couple of Leheriyas, I have not found the perfect one – you know the fabric, colour, the spacing of the lines – where it all comes together to make that one delectable saree that you reach out for every time. And I must add here that the joy of searching and waiting for that perfect saree is as much as the joy of owning one. I wish today that I could look at the long lines of the Leheriya saree and predict not just its future but the future of the hand-woven saree. If you have read up until this point of the post, you are most likely an ardent saree lover who already knows that the Handlooms Reservation Act of 1985 may be repealed. If this act is indeed repealed, power loom owners will be able to produce hand woven design en masse at cheaper rates thus putting handloom weavers out of their livelihoods. Note: All pictures and images here are protected by copyright as mentioned. These images may not be used, downloaded, saved by anyone nor may they be used for any purpose whatsoever without the permission of the website manager. I really enjoy your blog. I don’t own any lehriya saree now I would like to go for one. As I am not from India . But I am a saree pe varee person too.